As an intern for PAHRC, I was tasked with processing the collection titled, John Gilmary Shea Correspondence, 1836-1891 (MC 51). John Gilmary Shea was not only a writer, editor, and lawyer, Shea was considered the leading American Catholic historian of his time. Shea was only 14 years old when he published his first article, a short essay on Cardinal Albornoz in the Children’s Catholic Magazine. It wasn't until the 1850s when Shea really began his work in American Catholic history. 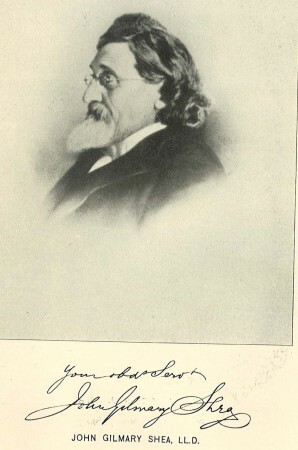 Between 1852 and 1855, Shea published several scholarly works that were critically acclaimed: Discovery and Exploration of Mississippi Valley (1852), History of the Catholic Missions Among the Indian Tribes of the United States, 1529-1854 (1854), An Elementary History of the United States (1855), and A School History of the United States (1855). Shea was very passionate about his life as a scholar; so much so that over the next four decades, he published two hundred and fifty articles and books. His magnum opus was a four volume series titled, The History of the Catholic Church in the United States, published between 1886 and 1892. With all of Shea’s publications over the decades, it is reasonable to assume he relied on his expansive network of personal and professional relationships to obtain the pertinent information required for his extensive scholarly works. The Shea correspondence collection I processed in late fall 2012 provides a unique perspective and reveals Shea’s activities as a writer, researching scholar, historian, and friend. During my initial review of the collection, I found that most of the correspondence was overstuffed in worn out archival folders and boxes—a preservation nightmare. I was fortunate enough to find one positive quality about the collection; it was previously processed at the item-level which may prove useful to researchers. After discussing an appropriate processing plan with Faith Charlton, PAHRC’s then Reference and Technical Services Archivist, we devised a plan that included: keeping the item-level correspondence intact while updating correspondents’ names to Library of Congress Name Authority File (NAF) as well as their religious order (where applicable); performing basic preservation such as re-housing and removing rubber bands/staples/paperclips; and creating a finding aid in Archivists’ Toolkit. The most challenging aspect of processing the collection came from the fact that Shea had a substantial amount of personal correspondence; the collection is housed in approximately seven boxes. The bulk of the collection is comprised of incoming correspondence. Some of the larger files with twenty or more letters are from notable figures who helped Shea during his scholarly years. For instance, the collection contains a large file of correspondence between Oscar Wilkes Collet, a writer, scholar, and member of the Missouri Historical Society. Here is a postcard received by Shea requesting help locating research materials. Another notable correspondent was John Wesley Powell. Powell was a U.S. soldier, geologist, explorer of the American West, and director of the Smithsonian Institution Bureau of Ethnology. 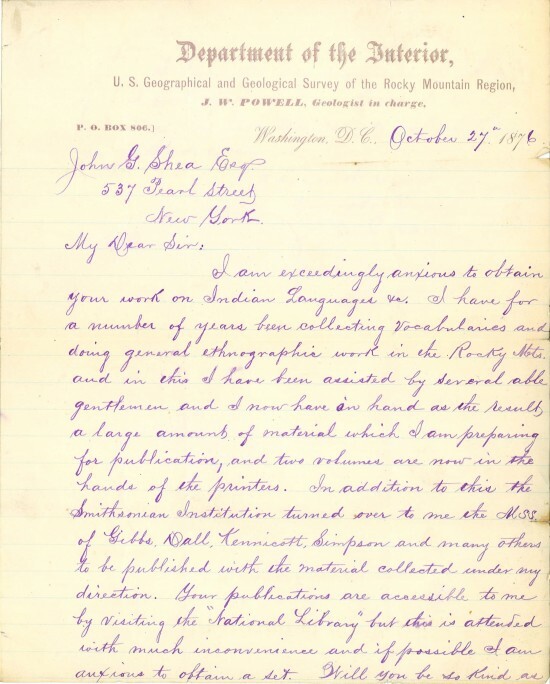 Letter written by John Wesley Powell, Geologist for the U.S. Department of the Interior, on October 27, 1876 requesting Shea's scholarly assistance. 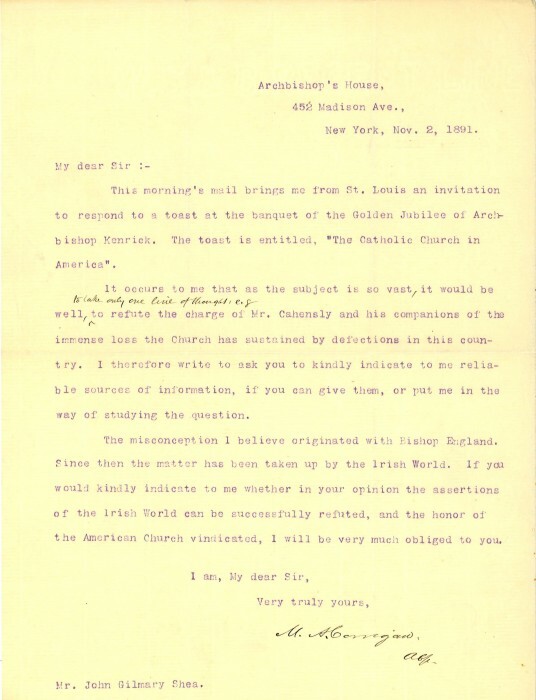 Another large correspondence file comes from Michael Augustine Corrigan, Archbishop of New York. Typed letter composed in 1891 by Archbishop Michael Augustine Corrigan asking Shea for clarification of sources to the assertion that there were large defections in the Catholic Church in America. Other large correspondence files contain letters from Archbishop James Roosevelt Bayley, James Cardinal Gibbons, Peter DeSmet, John Ward Dean, Edmond Mallet, and Eugene Vetromile. The collection is open to researchers. The PDF finding aid can be found here. PAHRC also has the original finding aid with item-level information which includes specific dates. If you would like to take a look at the original finding aid or any of our other collections, you can schedule an appointment to visit PAHRC or email us at pahrc89@gmail.com. The American Catholic Historical Society of Philadelphia. (1897). Records of the American Catholic Historical Society of Philadelphia Vol. VIII No. 1. Philadelphia: The Society.